The Bossard Memorial Library carries a variety of books covering the topic of UFOs. UFO researcher Chris Parsons will hold a lecture and discussion on UFOs on Nov. 3 at the library. 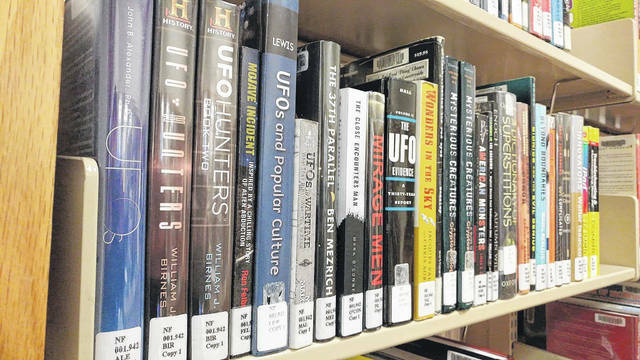 GALLIPOLIS — Bossard Memorial Library will be hosting Ironton native and UFO researcher Chris Parsons Nov. 3 at 6 p.m. to take part in a public discussion about unidentified flying objects, skepticism and what that means for the world. Parsons said he will be holding the event in two parts. First, he will lecture on how UFOs came to be studied and, secondly, he will hold a discussion with event comers regarding their questions and experiences. According to Parsons and his research, there are currently around 600 witnessed and recorded events spoken about in the UFO research community. Whether unidentified objects some see in the skies are alien or not, Parsons does his best to remain skeptical. He said it’s important to rule out all ordinary explanations before coming to the conclusion of extraterrestrial life in the universe. If the universe is unlimited in size, however, he says there are potentially infinite chances of life beyond Earth out there. He also says that given the history of the US government’s activity, one shouldn’t be surprised if the government did not choose to speak of alien activity openly. Parsons said he was first interested in UFOs during an experience in his childhood. Parsons said he was riding a new bicycle down the road before looking into the sky and noted a metallic disc flying silently. It would eventually disappear under cloud cover but impacted Parsons to dedicate his life to the research of such objects for the rest of his days.